Brown ground beef and onion in skillet over medium heat. Drain excess fat. Mix lettuce and tomato with ground beef mixture. Chop cucumber and mix with salad dressing. Place tortilla on a plate and spread with beef mixture. Top with cucumber and salad dressing mixture, and roll wrap. Each serving provides an excellent source of vitamins A and C and folate and is a good source of potassium and fiber. 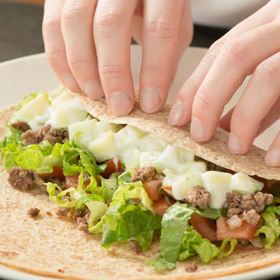 Serving size: 1 wrap. Amount per serving: 238 calories, 5.4g total fat (1g saturated fat), 22mg cholesterol, 33g carbohydrates, 13g protein, 4g dietary fiber, 373mg sodium.